This week two major book prizes made announcements in the children’s book world. The Carnegie/Kate Greenaway (CKG) announced their shortlists (the children’s equivalent of the Booker, let’s say), and Waterstones announced their Children’s Book Prize. Both produced antagonism and discussion – the CKG, because of its heavy leaning towards YA, an issue picked up by Fiona Noble in The Bookseller, who asked if there should be a section for the younger children’s fiction (as I, and the Americans, like to call middle grade). There was less contention over the Waterstones Children’s Book Prize, which already has three categories – picture book, younger fiction and older fiction. 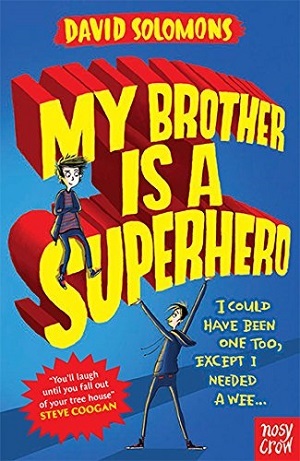 By the way, the winners of the Waterstones prize were David Litchfield for The Bear and the Piano, David Solomons with My Brother is a Superhero, and Lisa Williamson for The Art of Being Normal, with My Brother is a Superhero winning overall. Book prizes are tricky beasts. Are they like end-of-year book lists – sent to provoke disagreement? Are they solely for rewarding merit – and if so how do we really judge one piece of subjective artistry against another in any sphere of the arts? Or are they about money? In March 2014, a study showed that winning a prestigious literary prize equalled a sharp downturn in ratings on review sites by readers. Is this because readers have higher expectations of those books, judge them more harshly when they read them, and so ultimately feel let down, or are readers reading books that they wouldn’t otherwise have chosen, and actually aren’t suited to? Winners of prizes may sell more books, but the reader’s judgement or criteria for buying a book shrinks to one determining factor – that it won a prize. Is it bought for kudos rather than for the other qualities that might make it attractive to the reader? Qualities a reader usually applies when choosing a book, such as subject matter, style, author loyalty, etc. To the book trade, does it really matter if a reader finishes the book they’ve bought and enjoys it? Publishers love to stick stickers on the front of books announcing which shortlists they’ve made it onto, which prizes they’ve won. It’s a commercial reality that prizes equals prizes. Frances Hardinge not only won the children’s book prize at the Costa this year for her book The Lie Tree, but also the overall prize (well-deserved, and a brilliant book in my opinion) . And her publisher reported an increase in sales by 350 per cent in the three weeks after the win. Publishers choose which books to put forward for most prizes in the first place. Are they likely to put forward not only ‘good’ books, but books which follow a recent trend, or books that seem more likely to carry forward that sales impetus? For example, do publishers put forward more YA titles for the Carnegie than middle grade books, knowing that YA sells well at the moment? It’s just a thought. When The Lie Tree won the Costa, booksellers frequently stocked the title in the adult section of the bookshop, or the YA section – whereas its category is borderline middle grade to YA (suitable from 12 years). Although interestingly, it’s not the publishers who put forward books for the CKG – every member of CILIP (Chartered Institute of Library and Information Professionals) nominates two books for each award. But in the end, it’s the judges, not the publishers, who decide the winners. And who are they? It depends of course on the competition. In the children’s book world, this can be hugely contentious. Are we asking adults to pick the best children’s books? Are they best placed to judge what a five-year-old, or a ten-year-old likes? Or are we choosing a book with the most literary/illustrative merit, not just the most popular? Which people can best judge – those who sell the books – those who stock the books in their libraries – teachers – or even, *whispers*, the children themselves? Of course in the end it’s subjective. We are judging artistry, not maths. One can argue endlessly about the great writers who never won awards – why did Faulkner never win the Pulitzer? Why did James Joyce never win a Nobel Prize? Even the Ancient Greeks gave prizes for literary merit – regularly awarding prizes for best tragedies and comedies at their festivals. And I bet there was as much contention as there is now – Medea, for example, was only awarded third place. In the end, it’s about recognition. I know plenty of authors who have their work published and then worry that their publisher made an error – authors are full of self-doubt! So it’s lovely to be rewarded for one’s literary prowess, or ability to make children laugh, and then have sales spike too. (The prize money helps – most authors earn very little). And publicity – the more we talk about books, the more we celebrate books and writers, the more attention we draw to them, and spread the word about reading and books, then hopefully the more we inspire children to read. Because books are “dreams that you hold in your hand” (Neil Gaiman).